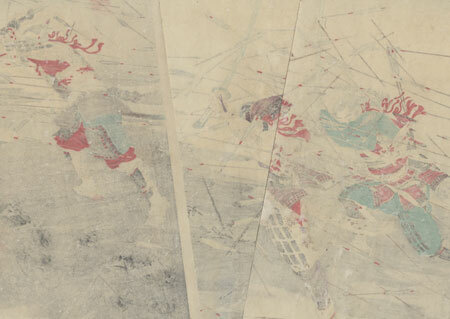 Comments - Incredible triptych depicting the last stand of the Kusunoki clan at the Battle of Shijonawate in 1348. Fighting for the Southern Imperial Court during the Nanbokucho Wars, Kusunoki Masatsura's forces were attacked at Yoshino. Feeling too weak to defend the temporary Imperial Palace, Masatsura led his troops out to meet the Northern forces led by Ko no Moroyasu, the pair eventually fighting hand-to-hand. Just about to take his enemy's head, Masatsura was shot by an arrow and then committed suicide. 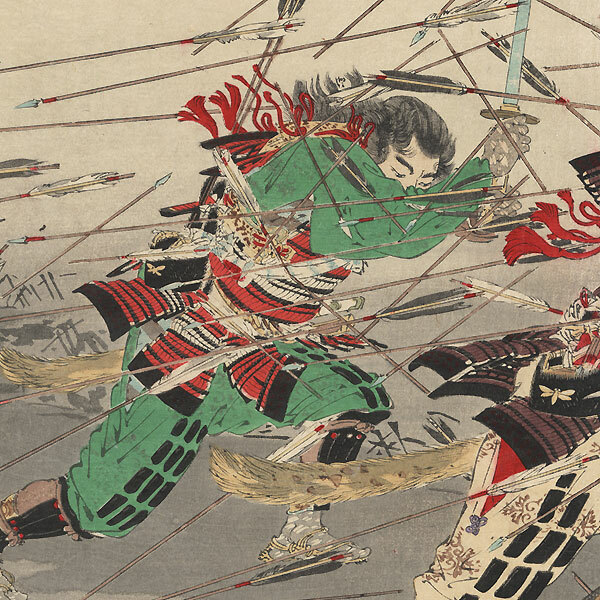 Here, Masatsura and two retainers rush headlong into battle under a hail of arrows, using their swords and spears to cut the missiles in two. He holds his battle helmet protectively over his face as he fearlessly faces the enemy, the ground littered with broken arrows. A dramatic image, full of energy and embodying the valiant spirit of the samurai. Wonderful detail in the armor and weapons, with touches of burnishing and a dusting of mica over the sky. A great warrior subject. Condition - This print with excellent color and detail as shown. Three separate panels. Light vertical fold in each panel. Slight soiling, a few creases and spots. Please see photos for details. Good overall.